I did some surgery on the Yellowstone board, in an attempt to address major problems with power supply noise and data bus overshoot, previously discussed here and here. I replaced the 74LVC245 that drives the data bus with a 74LVC8T245. That’s a dual-supply chip that some readers suggested earlier: it ensures the bus outputs will drive all the way up to 5V, while hopefully reducing any noise coupled to the 3.3V supply, and avoiding the possible violation of limiting values with the 74LVC245 that I mentioned in my last comment to the previous blog post. The Yellowstone board still mostly works with the 74LVC8T245, but now the data bus overshoot climbs to a whopping 9 volts! Arrrrgh. Channel 1 (yellow) is a copy of the Apple II slot’s /IOSELECT signal, passed through the FPGA. When it goes low, it means the Apple II wants the card to drive the bus. 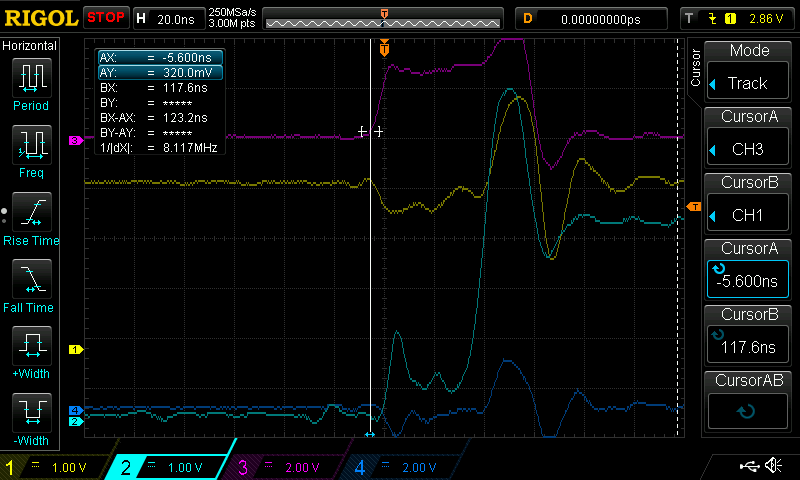 Channel 2 (light blue) shows D0 on the data bus, with a nasty overshoot. 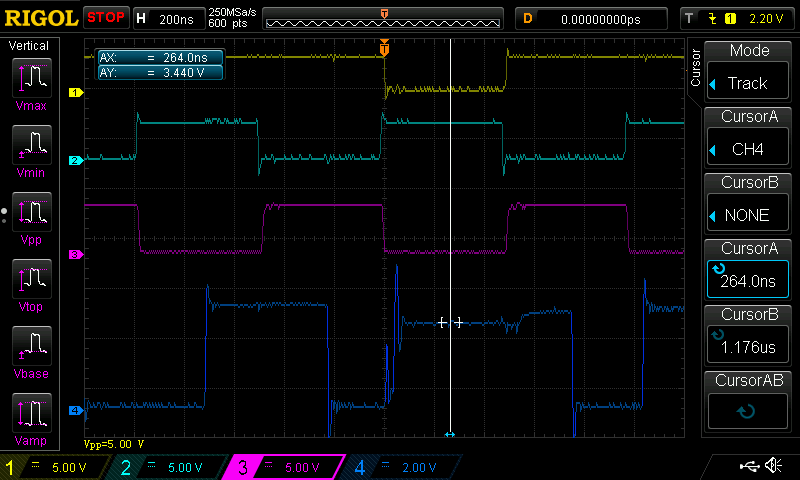 Channel 3 (pink) is an internal active-high debug signal from the FPGA that shows when it’s outputting a value for the 74LVC8T245 buffer. This is a sanity check on what’s happening. Channel 4 (dark blue) shows the Yellowstone card’s ground, with respect to the Apple II system ground. Note there’s about 1V of peak-to-peak ground noise. Something is badly wrong, and I can’t find it. I could design a new board with some series termination resistors, as a few people suggested, but my intuition is that isn’t really the main problem. None of the other Apple II cards I’ve examined appear to use any termination at all. 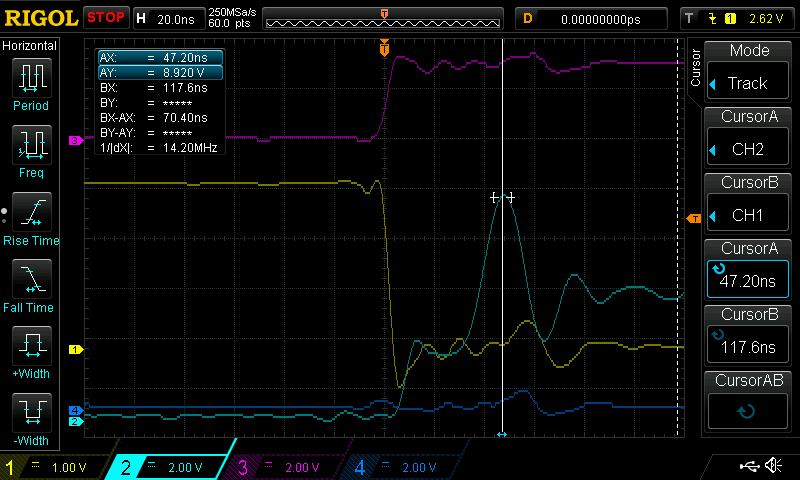 9V is a massive overshoot. And termination issues wouldn’t explain the problems observed on the card’s 3.3V power and GND supplies. I feel like I’m headed down the wrong path. I’m still struggling with these Yellowstone card electrical problems, but getting nowhere. Very frustrating. I’ve focused my attention on the large amount of overshoot on the data bus, and the power supply fluctuations, under the theory that minimizing those will eliminate all the functional glitches and failures I’ve experienced. The FPGA has eight bidirectional pins that are connected to one side of a 74LVC245 buffer. The other side is connected to the data bus. The buffer’s direction is controlled directly from the CPU’s R/W signal, and the buffer’s output enable is controlled by FPGA logic. The FPGA pins direction are controlled by separate FPGA logic. See the schematic here. The image above shows the moment when the card starts to drive a value on the data bus. Channel 1 (yellow) is a copy of the slot’s /IOSELECT signal, passed through the FPGA. When it goes low, it means the Apple II wants the card to drive the bus. Channel 2 (light blue) shows D0 on the data bus. 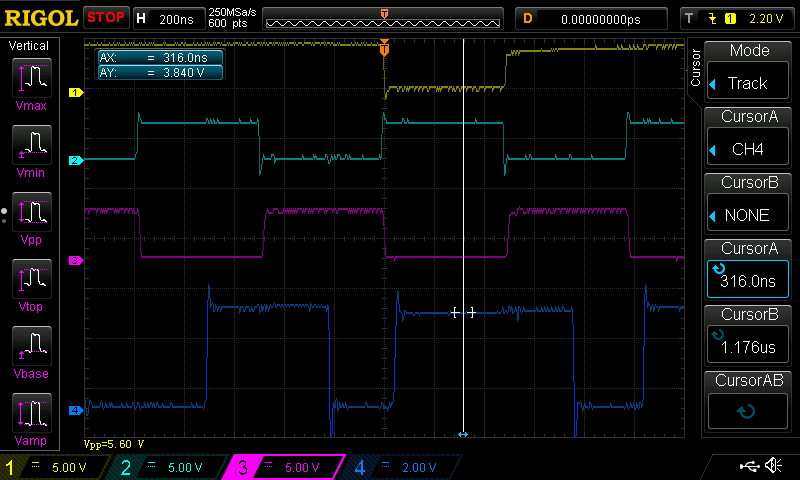 Notice how it climbs from 0 to 2V, retreats back to near 0, shoots up to 4.6V (a good trick for a 3.3V chip), and finally settles at 3.3V? Yuck. 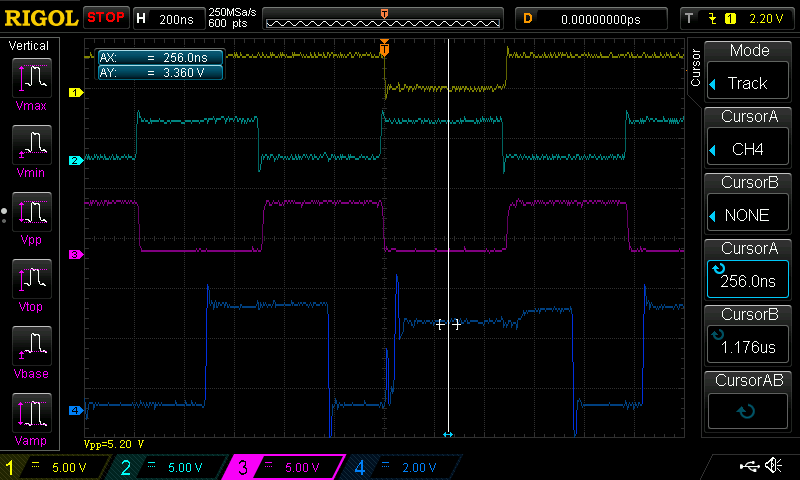 Channel 3 (pink) is an internal active-high debug signal from the FPGA that shows when it’s outputting a value for the 74LVC245 buffer. This is a sanity check on what’s happening. Channel 4 (dark blue) shows the Yellowstone card’s ground, with respect to the Apple II system ground. Note the scale: it doesn’t look like much, but there’s almost 1V of peak-to-peak ground noise. Besides the data bus overshoot, there’s also something odd with /IOSELECT on channel 1. Because there’s no convenient place for me to physically probe the actual /IOSELECT signal, I used an FPGA debug output pin to mirror /IOSELECT and capture it with the scope. The result should look identical to the actual /IOSELECT, except shifted to 3.3V logic levels rather than 5V, and with a few nanoseconds of extra delay. 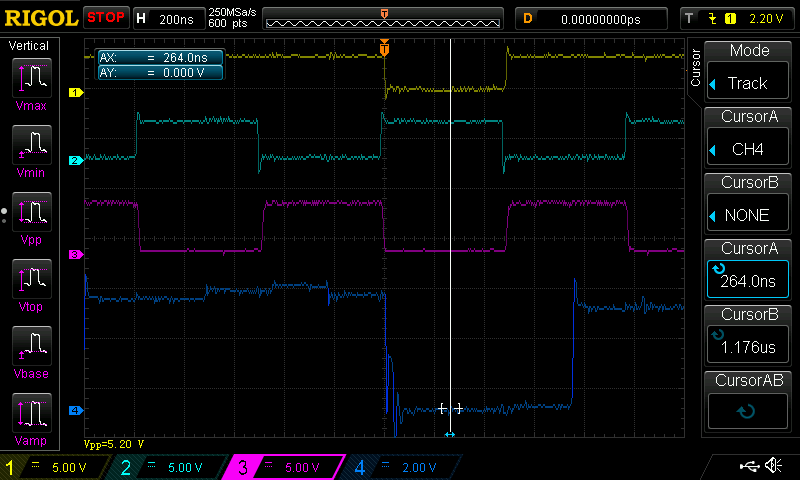 But why is there 1V of undershoot on the scope when /IOSELECT first goes low? The scope is capturing a debug output that’s just a two-inch trace on the Yellowstone card, with no other load except the scope probe. I was not expecting to see any undershoot or overshoot on these debug signals, and the channel 3 (pink) debug signal doesn’t show any. This looks like some kind of glitch, because the FPGA is only outputting for about 60ns, but a normal output lasts about 500ns. /IOSELECT starts to fall, but then goes back up, and shoots up to 5.0V (remember this is an output from a 3.3V chip). 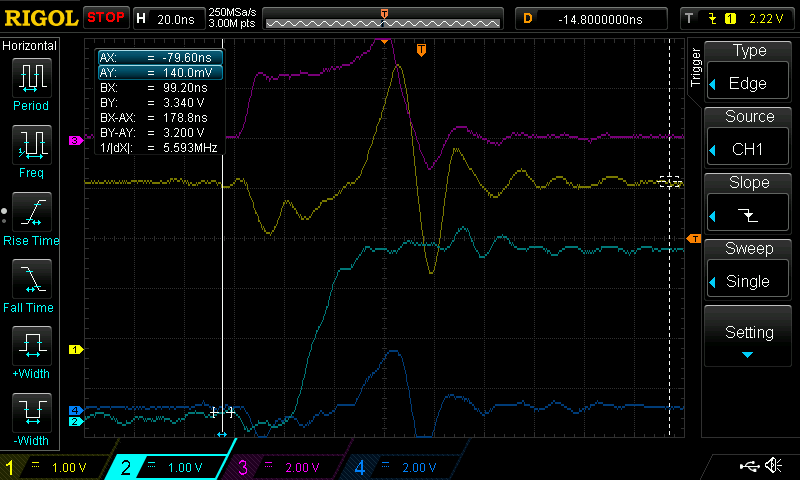 The data bus voltage spikes to 6.6V, and the Yellowstone ground reaches 2.0V relative to Apple II ground. Arrgh! If R/W is zero, then isOutputting must also be zero, but from the scope trace it’s obvious that’s false. There’s something happening here that I don’t understand. Maybe the Apple II motherboard’s data bus buffer direction isn’t driven from the CPU’s R/W, but from some other buffered or computed signal. When I rearranged some things in an attempt to investigate the glitch further, it disappeared. I was never able to find an explanation. There are so many strange unexplained problems, it’s a miracle that the card actually works most of the time! 4. Impedance mismatch on the data bus, signal reflections, etc. 1. 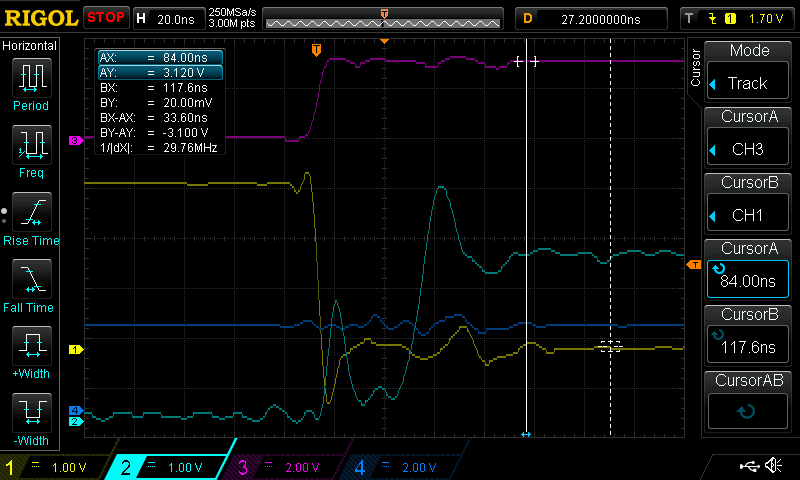 There’s a 300 mV LDO on the card, which I’ve calculated should be enough for the average demand. Brief spikes in demand should be satisfied by the capacitors. What’s the behavior of a typical LDO when it’s overtaxed? Does the regulated voltage drop, or does ground get pulled up, or both? If I make another revision of the Yellowstone board, I’ll substitute a larger regulator just to rule out this possibility. 2. My intuition pointed to this explanation first, but it hasn’t been confirmed by experiments. 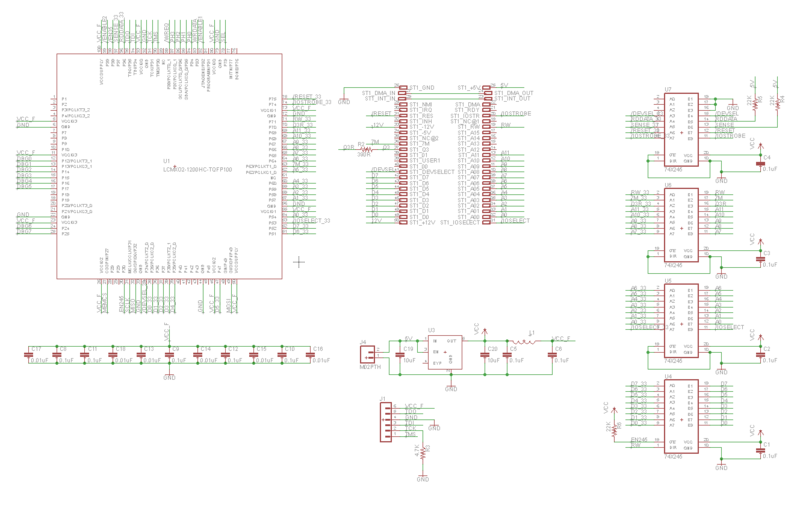 You can see all the bypass capacitors in the schematic: at least one 0.1 uF ceramic cap for the power supply on each chip, plus others recommended by the FPGA and LDO datasheets. I tried jury-rigging additional capacitors at various points on the board, but they didn’t make an observable difference in the signals as viewed on the scope. And even if this were the problem, I could imagine it causing the overshoot seen on the databus, but I can’t see how it would cause Yellowstone’s ground to rise to 2.0V relative to Apple II ground. 3. 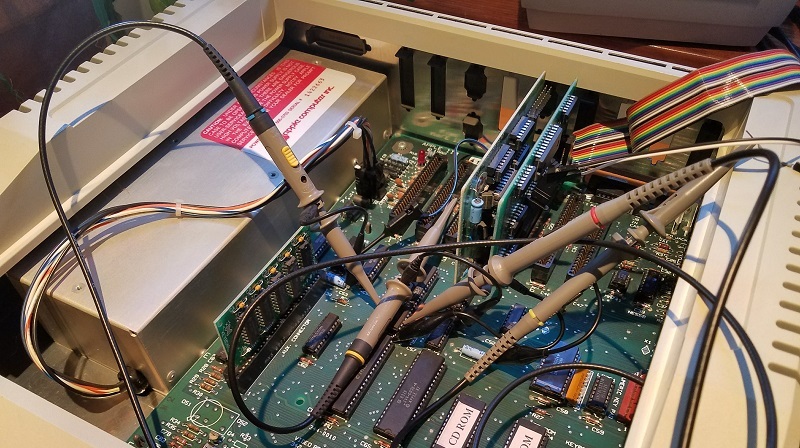 I tried connecting some extra jumper wires from ground points on the card to ground points on the Apple II motherboard. It didn’t make an observable difference in the signals as viewed on the scope. But maybe 5V has a problem? 4. An impedance mismatch could be part of the problem, but what would I do about it? The Apple II bus can contain anywhere from zero to six other cards of assorted types, so it’s not clear what impedance I should try to match. And all the vintage 1980’s cards I’ve observed don’t appear to have any termination resistors or other obvious impedance matching circuitry – they just connect a 74LS245 or similar buffer chip directly to the bus. For clarity, I don’t think Yellowstone’s use of a 3.3V 74LVC245 is a problem, at least not in the way suggested by some commenters. Yes, this chip can only drive to 3.3V, but that’s plenty high enough to register as a logical high for the 74LS series logic used elsewhere in the Apple II. 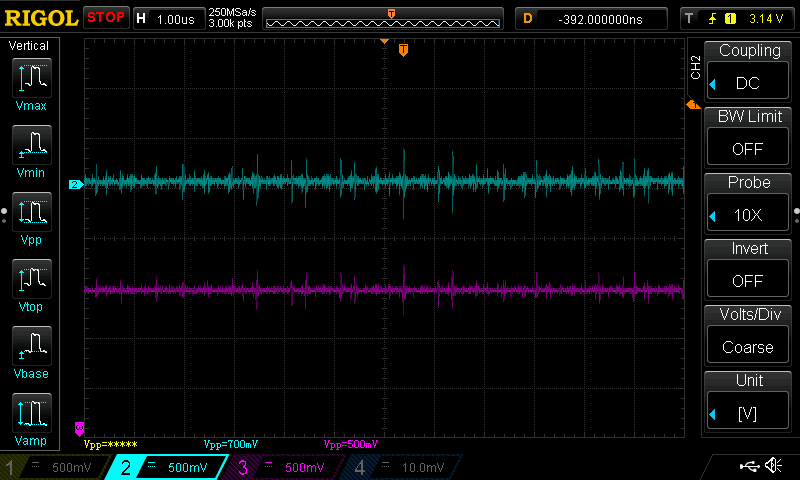 And the scope traces clearly show that the data bus voltages are high enough. If the 74LVC245 is causing a problem, it must be some less-obvious mechanism like coupling noise to the 3.3V supply, or maybe a too-fast slew rate. I’ve pounded my head long enough, and am running out of ideas. Debugging is hugely impeded by the absence of any place to physically probe many of the bus signals, and by a scope with only four analog channels. The scope also has a 70 MHz bandwidth, which might be a factor. I feel too much like I’m scratching randomly in the dark, rather than making systematic progress towards narrowing down the causes of the problems. My temptation is to design a new revision of the card, and include some speculative changes that might help. I could substitute a beefier LDO, add more capacitors, make the power connections extra-robust, and include additional debug headers for probing bus signals. It can’t hurt, but realistically it probably won’t help either. I could also try adding some termination resistors, but that just seems wrong somehow, given that no other Apple II cards appear to use them. Electronics can be hard. In the 10 years I’ve been writing this blog, I’ve never encountered a problem that had me so completely stalled as this one. I’ve discovered a troubling problem with the Yellowstone disk controller for Apple II, and I’m unsure how to debug it. When it’s functioning as a Liron clone, Yellowstone isn’t playing nicely with other cards like a stock Disk II controller card. 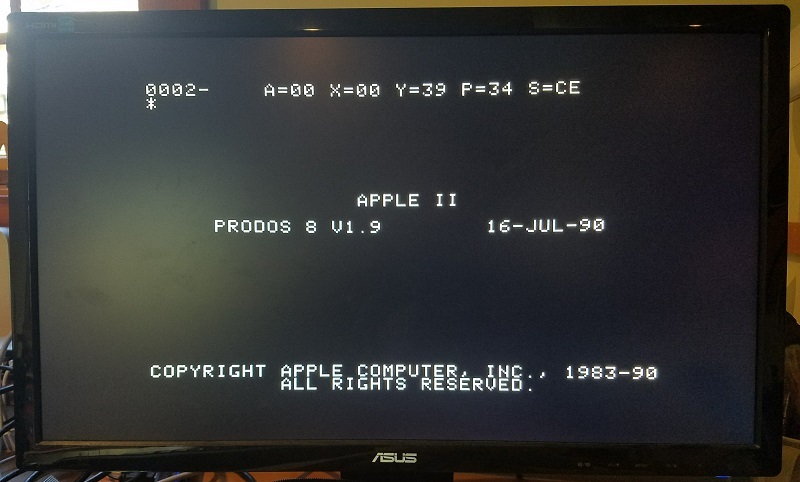 While booting from a Prodos 1.9 disk image using a Disk II controller in slot 6, Prodos crashes midway through booting if the Yellowstone card is present in slot 5. This happens even if there aren’t any drives connected to the Yellowstone card. It’s not 100% reproducible, but happens maybe 90% of the time. Yet everything works fine if I repeat the test with a real Liron controller card instead of the Yellowstone card. That means it’s my problem, and not the Liron designer’s. I believe what’s happening is this: the Apple II scans the slots beginning with slot 7, and moving towards slot 1, looking for cards with a bootable ROM. It finds the Disk II card in slot 6, and jumps to its ROM code. That code loads sector 0 from the Prodos disk, displaying the splash screen shown in the photo. Then before Prodos has finished fully loading, the Apple II resumes the scan and jumps to the Yellowstone ROM code for slot 5. This code should look for attached Smartport devices, find that there aren’t any, and return. But somewhere during the execution of that ROM code, or during execution of the Prodos code just afterwards, something goes wrong. The Apple II stops and displays a system monitor prompt. Crash. Where do I begin, with a bug like this? I don’t really know anything about the inner workings of Prodos, or even about the ROM code on the Yellowstone card, since I simply copied it verbatim from the Liron card without really studying it. That means I can’t easily figure out what the computer is trying to do at the moment it crashes. My first guess is that I’m experiencing data bus contention, and the Yellowstone card is interfering with the Disk II card. 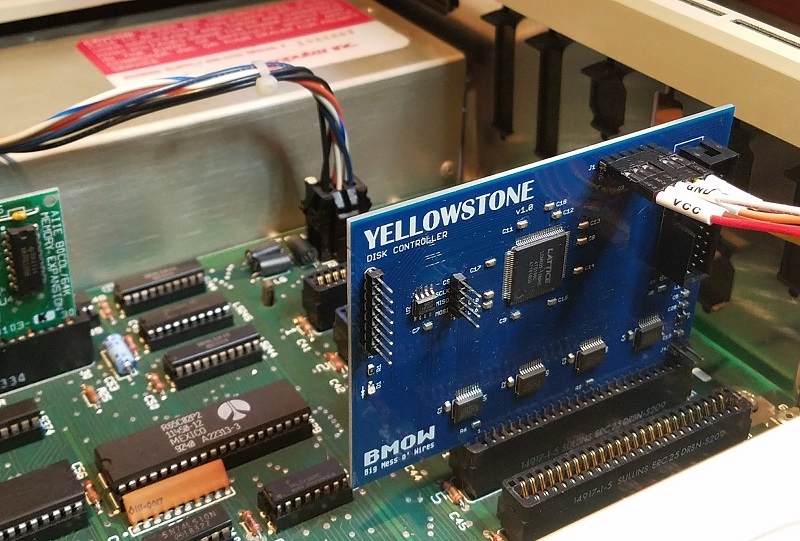 The Disk II controller card and the Yellowstone card might both be attempting to put data on the bus at the same time, interfering with each other, and causing wrong values to be read from ROM code. But it’s hard to imagine how Yellowstone could be driving the bus at the wrong time. The output enable logic is pretty simple, and the Apple II already provides each slot with its own fully-decoded enable signals /DEVICE and /IOSELECT. There is a region of the Apple II address space that’s shared by all cards, and that uses a shared /IOSTROBE enable signal, but the Disk II card doesn’t use that address space. My second guess is the reverse of the first: the presence of the Disk II card is somehow interfering with the Yellowstone card, exposing a flaw in the Yellowstone design that doesn’t appear when Yellowstone is the only card present. Maybe it’s somehow causing Yellowstone to malfunction. But I can’t really imagine what could cause that. A third possibility is a problem caused by Prodos itself, rather than by the Disk II card. Maybe the first portion of Prodos alters some memory locations or sets some interrupt timers, or changes the system state in other ways that cause the Yellowstone boot ROM to fail. But it’s unclear why such an issue wouldn’t also affect a real Liron controller card in the same way. A final possibility: maybe there’s a hardware problem with my Apple IIe, and there’s not enough juice to power two cards simultaneously, or the logic board is flakey. In the past on this same computer, I’ve occasionally seen similar crashes to the system monitor while booting Disk II software, long before Yellowstone even existed. Coincidence, or clue? I’m scratching my head, trying to think what I could do to help troubleshoot this further, but I don’t have any great ideas.